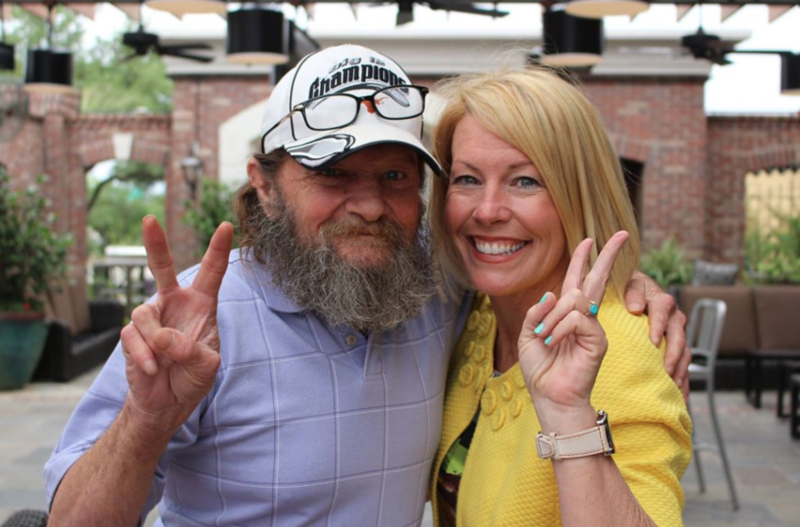 This is another story we received from a woman named Kate who lives in Nashville but met her friend Eddie, who was homeless, while she still lived in Austin. Read their amazing story below! Back around 2010 when my kids were little, we went to a McDonalds near our home in Austin. As we were walking across the parking lot, an older, frail homeless man using a shopping cart as a walker passed at a snail's pace in front of us. We exchanged hello's. After he passed us, I turned back and said, "Do you want to come inside and have a hamburger with my family?" That question became one of the most important things I have ever done in my life. While the kids played on the playground, Eddie and I talked and talked. I asked him "How many times have you been in jail?" He replied, "So many times I have lost count." I knew right then that we would be friends. That was the most honest answer I had received in a decade. Over the course of several years, we visited Eddie on the street corner or under the bridge where he lived almost every week. We celebrated his birthdays, brought him turkey on Thanksgiving, my daughter did an Easter egg hunt for him one year, and he came over to our house for dinner a couple of times. He became our "5th family member". I also learned how pitiful our social services are for people like Eddie. We made countless trips to various offices to get food stamps set up and his social security benefits to start paying (Eddie paid into SS in his younger years and I knew if he has a stream of income he could get off the street). Without a birth certificate he couldn't get an ID. Without an ID he couldn't get anything. Round and round we went. Then there was the news in 2012 that my husband got a new job in Nashville and we were going to be moving away. The day I said goodbye to Eddie I have never cried harder over anything. I felt like I was abandoning one of my children on the roadside. I cried for three hours while driving towards Nashville. "Hi, this is Jennifer. I am here with a guy named Eddie. I'm a volunteer and I'd like to work with him" (Miracle #1) Jennifer helped Eddie tremendously and kept him in touch with me. Then April of 2016 I flew to Austin for a work meeting. I was determined during that weekend to get Eddie's social security set up. I called ahead and was told exactly what we needed to do. Long story short, what I was told on the phone was completely false and we were once again turned away by every office. It was the first and only time I had ever seen Eddie cry. I flew back home feeling like a complete failure. In 2017, I flew to Austin and all of the volunteers (Jennifer, Doug, Sherry, Jay, Kristen, Dory) who came into Eddie's life, who were total strangers to each other, got together for lunch to celebrate. 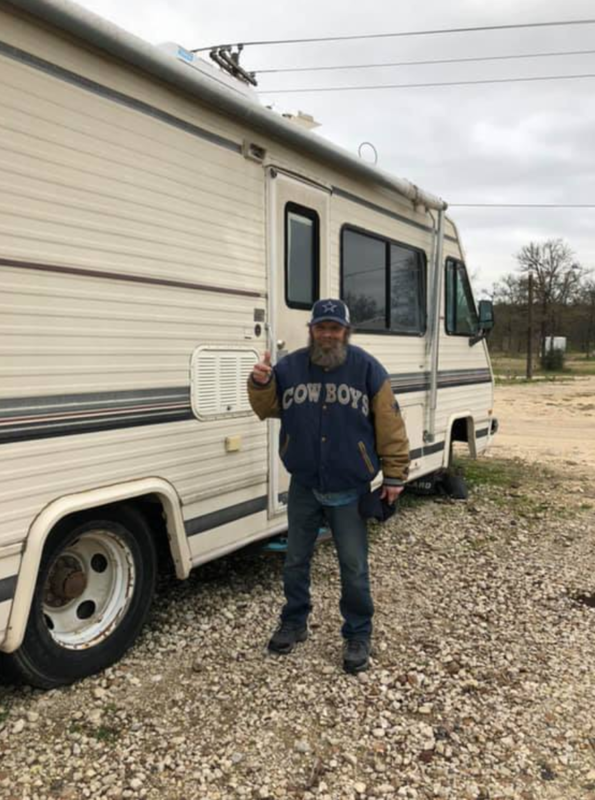 In 2018, Eddie was able to save up $5000 and buy his very own trailer WITH CASH. He officially had a home and continues to live there! 2019: Eddie is not in good health. His memory has gotten bad and the years of wear and tear have caught up with him. Doug and I talked last week about what we were going to do when he passes away. Funerals and cremations cost thousands of dollars. I learned last week that Travis County has a burial program for low-income people. They cover the costs and offer a visitation, plot of land, 20 minute graveside service and name plate. I sobbed as the woman on the phone shared this with me (the second hardest I have cried since leaving Austin). I cannot begin to tell you how much it means to me that Eddie will a proper burial with respect and truly rest in peace one day. I am the one writing this story. But Eddie's story has been a huge team effort - all by unselfish, caring strangers. Eddie says I was the first angel who came into his life. But there were many who followed. And it all started with 13 simple words "Do you want to come inside and have a hamburger with my family?" During Eddie's hell living under a bridge, he never complained one time about anything. When I asked him "Eddie, how's it going?" he always replied "Fantastic! God has been good to me"
I got to know many homeless people who came and went near Eddie. I asked them about their families and childhood. Homeless people are not "lazy bums" who refuse to contribute to society. The ones I met were very broken. They were neglected as children and their friends/family were dead or incarcerated—so they had no support system when they fell upon tough times. One young guy Scott, his mother committed suicide when he was 11 and his father disowned him. He enlisted in the army, but one weekend he was home he ran his car under an 18-wheeler and sustained significant brain damage. He was mentally and emotionally crippled. And homeless. Another was sodomized as a child. One tragic story after the next. I learned that a vast majority of my "Christian friends" wanted nothing to do with Eddie. One friend (who attends church twice a week) said to me "Ugh, I could never talk to a homeless person. I don't know how you do it." I think this has bothered me more than anything. I encourage you to find someone deemed "the least" and befriend them. You will find that they are no different than you. And more times than not, they will do more good in your life than you will do in theirs.